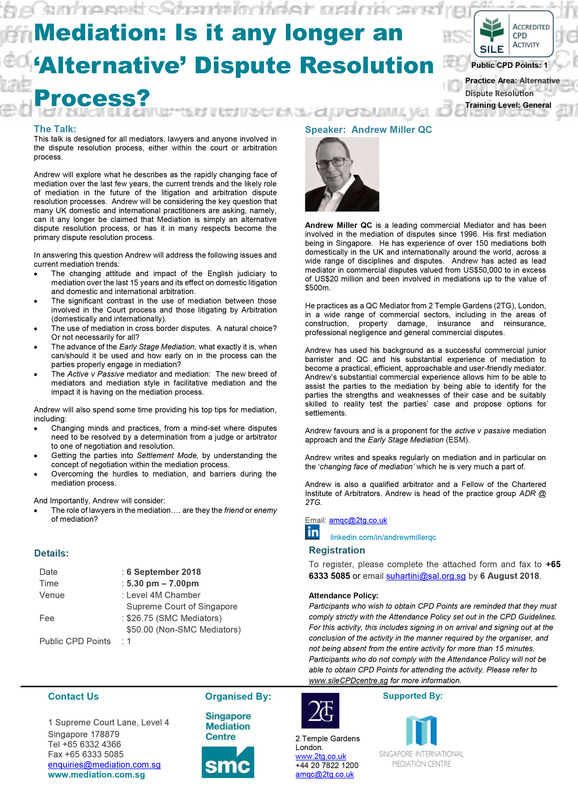 Andrew Miller QC will explore mediation in the last few years, the current trends and the likely role of mediation in the future. He will be considering the key question that many UK domestic and international practitioners are asking, namely, can it any longer be claimed that mediation is simply an alternative dispute resolution process, or has it in many respects become the primary dispute resolution process? The workshop is organised by the Singapore Mediation Centre and 2 Temple Gardens, and supported by the Singapore International Mediation Centre. For more information and to register for this event, please complete a registration form here and fax it to (65) 6333 5085 or email suhartini@sal.org.sg by August 6, 2018.